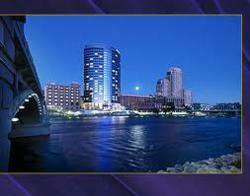 Today in America TV announces air dates for Grand Rapids, Michigan in the month of March 2012. “Furniture City” will be able to watch the award winning program on CNN Headline News via the Charter cable television system. Today in America TV is first to inform the audience of topics that affect them. Know the name Daniel F. Gerber? What about Steelcase? These are two of the well known product brand names made in the city of Grand Rapids, Michigan. Today in America TV presents March air dates for the area known as “Furniture City”. Also known as a city of “firsts”, it was the first to put fluoride in its water, the first Braille dictionary was compiled by Roberta Griffith; the first commercially prepared baby food was made here by Mr. Gerber. Most of all, Grand Rapids is the home of 38th President of the United States, Gerald Ford and his equally famous wife Betty Ford. Due to its close proximity to Lake Michigan, the climate is considered prime for apple, peach, and blueberry farming. Today in America TV brings viewers educational stories about what's happening in a variety of fields around the country and around the world. Our host, Terry Bradshaw is a popular and beloved sports celebrity. He holds the distinction of being the first quarterback ever to win four Super Bowl Championships. Twice named as Super Bowl "MVP", Bradshaw holds Super Bowl all-time passing records to this day. He is also a very much requested motivational speaker to Fortune 500 companies. He can be seen on Fox NFL Sunday as an analyst. 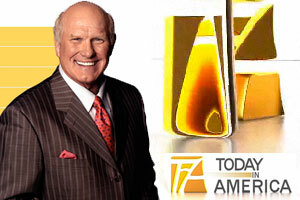 Today in America with Terry Bradshaw is a cable television news program that is committed to informing the audience about topics that influence their lives. The program covers topics such as family recreation, health and wellness and renewable energy solutions as well as many more. The show can be seen on local, regional and national cable channels such as CNN Headline News, Fox Business Morning, and ESPN 2 and ION. For a Today in America sample, or to peruse the very cool Magazine, please visit todayinamericatv.com.